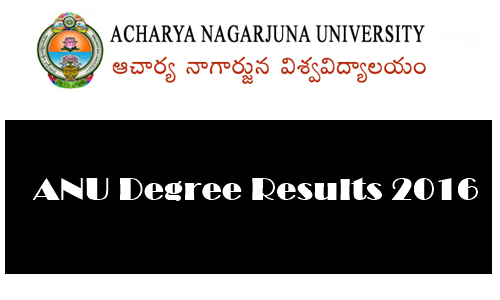 ANU Degree 1st sem Results 2016 – Manabadi UG Result: Acharya Nagarjuna University has conducted the 1st semester examination in the months of October / November 2016. Candidates those have appeared for the ANU Degree first Sem Examinations are eagerly waiting for the results. The ANU is going to release the results soon on its official website, nagarjunauniversity.ac.in and manabadi. Check more details of ANU Degree 1st Semester from here below. The Acharya Nagarjuna University (ANU) is one of the reputed universities of Andhra Pradesh. The ANU offers various Under Graduate and Post Graduate courses for students. ANU offers degree courses such as B.Sc, B.Com, B.A, BCA, BAOL, BHM, BBM and Post Graduate courses such as MA, MBA, MCA, M.Com, M.Sc etc. Annually huge numbers of students are getting their certification from the Acharya Nagarjuna University. The ANU conducts the regular and supply examinations annually. Every year the ANU organizes the examinations in March / April months and October / November months as it is fallowing the semester system. In the year of 2016 the ANU has conducted the Degree I Sem Examinations in the month of October / December. Candidates those have appeared for ANU Graduate Degree 1st year Regular / Supply examinations in Oct / Nov months are eager to check their results. Before year the ANU has announced the results in last week of December. Similarly, this year the ANU is likely to release the ANU Degree 1st Sem Results 2016 For Regular / Supply results in 2nd week of January 2017. Hence candidates can stay tuned to ANU official page, nagarjunauniversity.ac.in for more updates. The results are going to release shortly. The ANU is going to release the results of various Graduate Degree courses such as BA, B.Com, B.Sc and other courses. Candidates can check their ANU DegreeFirst Sem Results 2016 For Regular / Supply, marks, grade obtained in the examinations. The official website of ANU is going to update the candidates about the results soon. Stay checking the website consistently to know more updates. How to check ANU Graduate Degree 1st Sem Results 206? That’s it the ANU UG First semester results appears on screen along with marks and grade.